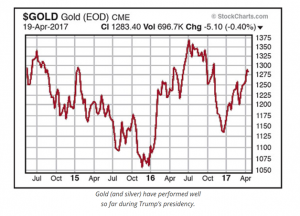 Investment bank Goldman Sachs made waves in late 2016 when lead equity strategist Peter Oppenheimer advised investors to look at “gold as a hedge” against then president-elect Donald Trump’s economic agenda. Many in the financial media agreed. Surely, the incoming administration would be good news for alternative assets and poor for traditional equities. Those prognostications didn’t play out very well during Trump’s first 100 days. Global equity markets showed resiliency in 2016 and early 2017 despite enormous political turmoil in Europe and the United States. Much of this blame lies at the feet of the Federal Reserve and the Treasury, which continue to support (directly and indirectly) bloated valuations for publicly traded assets. Consequently, gold and silver entered 2017 above 2016 levels but below 2015 levels. Fortunately for gold investors, the stability of equity markets didn’t mean stagnancy for metals. As the graph below shows, the first 100 days of the Trump administration proved profitable for those owning gold. The recent rise of gold is not particularly unsurprising. President Trump appears besieged by the media, by the Justice Department, and by foreign powers. 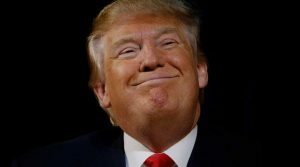 His staunch critics are only assured by his troubles while his supporters lose patience with his inability to deliver campaign promises. In other words, gold is glittering at uncertainty, but not the same uncertainty many foresaw six months ago. Asking Congress for $1 billion to fund a wall on the U.S.-Mexico border after promising that the Mexican government would pay for it. What does this all mean for gold? Uncertainty, no matter the source, makes for difficult business forecasting. In turn, this makes companies defensive and less likely to expand. Investors recognize this and either purchase less equity or lend less money (or, if prospects are really bleak, investors will sell off). The result is a weaker equity market, weaker bond market, and better prospects for haven assets.